The phrase 'beautiful office block' has a tring of the oxymoronic about it. Yet Ibex House, on the eastern fringe of the City of London, is undeniably attractive. This art deco masterpiece celebrated its 75th anniversary last year. How many of today's glass towers will still be around in 2085? By chance, a friend of ours recently stumbled across a copy of the Morning Post from 1937, lining a cupboard in her new home. 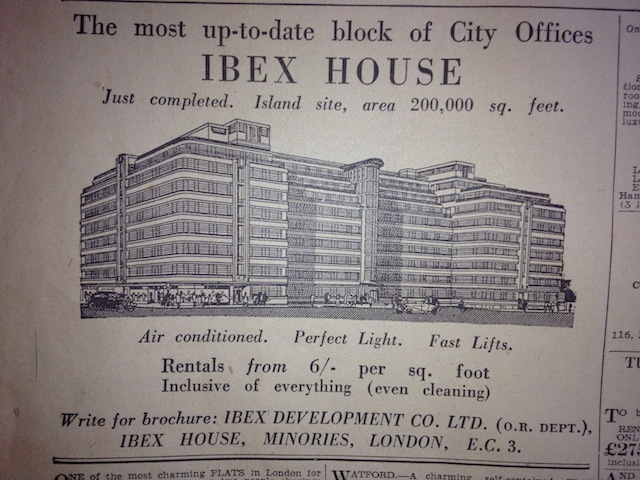 It contains this advertisement for Ibex House, back when it was "The most up-to-date block of City offices". 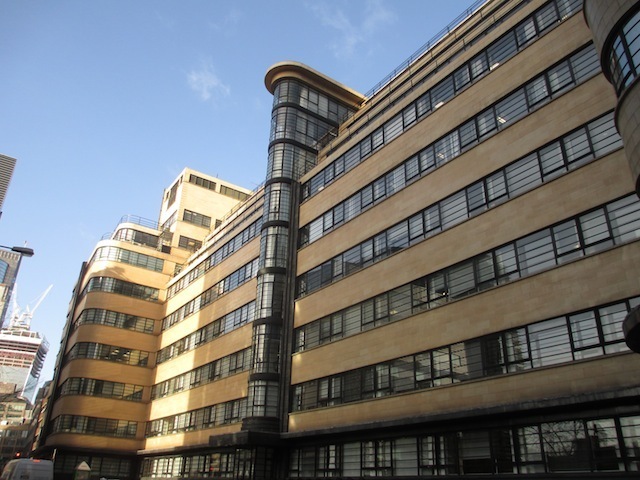 The building is an example of the Streamline Moderne flavour of art deco, most famously flaunted by the Daily Express building on Fleet Street. At the time of construction, Ibex House had the longest bands of glass in the UK. It's now Grade II listed. The quoted rental cost (inclusive of everything, "even cleaning") at the time was six shillings per square foot (a shilling was a 20th of a pound). Today, you can rent space in the building for £32.50 per square foot, exclusive of everything. With thanks to Steffi Suhr for the newspaper cutting.